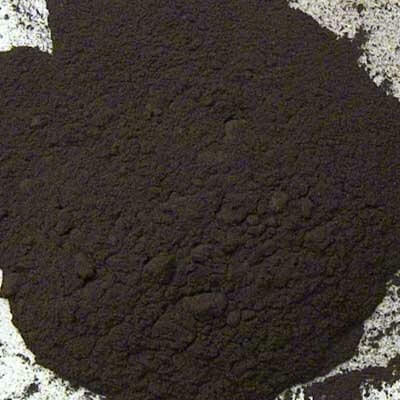 A transparent brown to black-brown mineral pigment used in tempera, oil and watercolor mediums, obtained from natural asphaltum deposits in Utah. Gilsonite, or North American Asphaltum is a natural, resinous hydrocarbon found in the Uintah Basin in northeastern Utah. This natural asphalt is similar to a hard petroleum asphalt and is often called a natural asphalt, asphaltite, uintaite, or asphaltum. Gilsonite in mass is a shiny, black substance similar in appearance to the mineral obsidian. It is brittle and can be easily crushed into a dark brown powder. The mineral now know as Gilsonite or North American Asphaltum was discovered in the early 1860s, but it was not until the mid-1880s that Samuel H. Gilson began to promote it as a waterproof coating for various products and as a unique varnish. Gilson's promotion of the ore was so successful that, in 1888, he and a partner formed the first company to mine and market gilsonite on a commercial scale. Gilsonite is found below the earth's surface in vertical veins or seams that are generally between two and six feet in width, but can be as wide as 28 feet. The veins are nearly parallel to each other and are oriented in a northwest to southeast direction. They extend many miles in length and as deep as 1500 feet. The vein will show up on the surface as a thin outcropping and gradually widen as it goes deeper. Due to the narrow mining face, Gilsonite is mined today, much like it was 50 or 100 years ago. The primary difference is that modern miners use pneumatic chipping hammers and mechanical hoists. Gilsonite is a transparent color; its transparency depending upon how it is makde into paint. It is typically used in glazes and was prized by artists in past centuries for its ability to add warmth and depth in shadows. Processing of Gilsonite now removes most of the inert contaminants and newer, more powerful, solvents make the higher softening point grades more interesting to the user. Today, Gilsonite is graded by softening point (a rough measure of solubility) and particle size. All grades carry a degree of quality far superior to those first small amounts of crude Gilsonite marketed in the 1880s. Our grade of Gilsonite is finely powdered and has a high softening point, 130-204 °C (265-400 °F). Gilsonite is compatible with vegetable oils (linseed, soya, etc. ), microcrystalline and paraffin waxes, aromatic and aliphatic solvents and rosins. Gilsonite is soluble in aliphatic, aromatic and chlorinated hydrocarbon solvents. It has limited solubility in most ketones, but is soluble in mixed aromatic solvents that contain a ketone component. 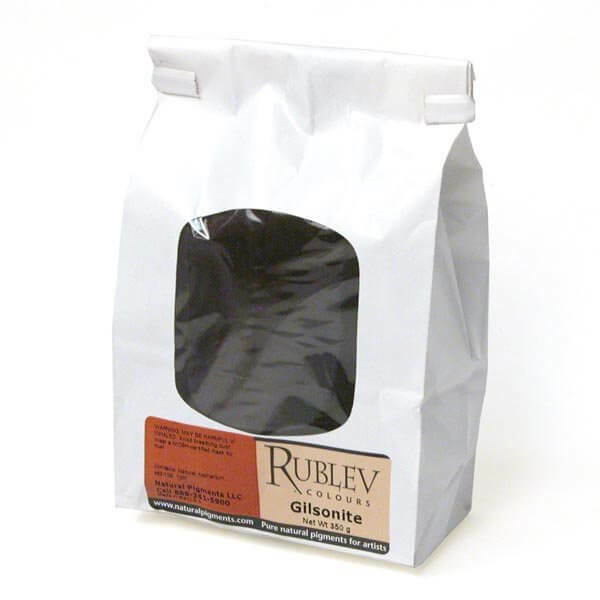 Gilsonite is not soluble in water, alcohols, or acetone. Gilsonite in its unaltered state is non-carcinogenic, non-mutagenic, and non-toxic by recognized test procedures, which include the modified Ames assay test, chronic feeding studies for the National Toxicology Program (NTP), and NIOSH protocols.